Guar seed recovered around 20.31% & Gaur Gum recovered around 30.33% from 1stJuly to 23nd July. Positive movement was noticed in complete guar complex. At the starting of July-16 guar seed was at the level of 3200/100 Kg. today it is being traded at 3850/100 Kg. It has recovered almost 20.31% or Rs 650/100 KG. Guar gum was at Rs 5600/100 Kg. Today it is being traded at Rs 7300/100Kg. There is recovery of 30.33% or Rs 1700/100Kg. This is very good return by this guar complex within 22 Days in this year. Estimate of Sowing of Guar is very low. Till 18th July, there is estimate of 9,00,000 Hectare guar gum cultivation from Rajasthan, 40,000 Hectare guar gum cultivation from Gujarat and 25,000 Hectare guar gum cultivation from Haryana. Total Guar sowing area is lesser than 10,00,000 hectare. At maximum side, guar cultivation area will not cross 12,00,000 Hectare during this year. In best possible condition production will not cross 60,00,000 Bags of Gaur seed. Or 6,00,000 MT. It far below the average of last year’s productions. Farmer will not go for fresh guar cultivation until guar will not cross 5000 level. It will not cross 5000 level in current crude oil rates especially in this remaining July month. . Farmers are interested but even current rates are not attracting to go for Guar seed cultivation. Farmers need a stable rate for guar seed cultivation. This is also good for industry if the guar seed production goes down. In this case over supply condition will not come and there will be balance between demand and supply. Export is flat as last year. Export data were released by Govt for different commodities. There is good news for guar gum export in provisional data. During April and May -2016 there was export of 59,609 Mt of Guar seed. In the same time in April and May-2015 there was export of 61,796 MT of Guar gum. Last year crude oil rates were also better than this year. It is clear that there is regular demand of commodity even at lower crude oil prices. Last year Guar gum was exported at USD 1901/ MT approximately 2 USD/Kg but this year it is exported at 1107 USD/MT or Approximately 1 USD/Kg. Last year there was export of 117 Million USD or 743 Crore INR. This year during April and May there is export of 66.01 Million USD or 440 Crore INR. It was noticed that export is increasing during June and July. Actual picture will come after release of data by the Govt. As per initial inputs it is increasing. Importer will also go for bulk buying before rates shore up. After knowing the fact that supply will shrink the importers will insure the smooth supply either they will go for stocking or they will give bulk order for annual supply. There will be holding at every level famer will hold for better price, processor will stock for Annual processing requirement. Stockist will stock in expectation of better return. Exporter will also hold as per requirement of Importer. In the shrinking of low cultivation area every stack holder will try to ensure the regular supply and better price. The best effect of this low cultivation area will come in next year because next year there will be no stock left as carry over. Major stocking activity of existing stock will take place before fresh production. Demand from local trader will give an upward movement. Once the stockist and speculators will active then price s will move upward very fast. There can be still chances of Return of 20-30% in next two months. Existing supply will also become tight. Already this is a restricted supply period. Only rich farmers or the farmers who have ability to hold the commodity is holding commodity. Rest of farmers have already sold the commodity after harvesting and as per their financial requirement. Initial effect of this low sowing will start to come during these two months or before fresh production. For next two month market will on the market sentiments as there are no fresh contract up to 15th October. For October contract guar complete is already strong. Guar gum has crossed 7300 level and guar seed has crossed 3900 level. It is very strong position. Meanwhile if the demand increases and supply shrinks at the time of harvesting the guar will be around 5000 level. Size of contract is also growing regularly. It is becoming less risky. Stockists from small-small town are active and right now Guar is only commodity which can be stocked for return or investment purpose. Consolidation of small-small stock has been start. If is good to invest in one year old commodity then fresh commodity, because in fresh commodity there is moisture loss. Market men think that this is good time for investment in guar. Some investor will wait for confirm news of sowing data after 15th August. Stockist have active in market. Guar gum preformed very well in this weak. it recovered from 3250 to 3450/100 Kg and gaur gum recovered from 5750 and reached up to 6200/100 Kg. In last two days of weak it lost the upper positions with declining crude oil prices in international market. Monsoon has almost started in all the Rajasthan Sowing has started in most of Guar cultivation area. In remaining 20-25 % area sowing will complete in next week. As per primary inputs Guar is not a priority crop for farmers in this year. In irrigated are farmers are going for Maize, Cotton, Rice, Lentil, Moong, Groudnut, Bajara, in rainfed area farmers are going for Moong, Moth, Bajara, Til. Guar gum seed cultivation area will shrink. Guar is cultivated from Haryana to Rajasthan and Gujarat. It has also increased in other states like MP. Maharashtra, Andhra, Telangana, Punjab, This year due to low rates guar will shrink mainly in Rajasthan and Gujarat. Small area can be come from Haryana. Traditionally guar gum was cultivated in rain fed area under low cost of cultivation condition. After the rainfall farmers used to take their camel in farm and start sowing of his in house stored seeds , there was requirement of minor weeding operation which was required to feed the grass to cattle/ animal. Right now situation has changed Guar cultivation has become expensive. It start from sowing by the tractor, using the good quality seeds, using agrochemicals for plant protection , applications of fertilizers, at every step cost is involved today. Some market men say that farmer will go for guar but if it is loss making cultivation then he will never go for Guar cultivation. Comparatively other crops are protected by MSP and giving good return to farmers even at market rates like Moong moth Bajara. Why farmers will go for guar cultivation in a loss making crop after paying money for cultivation. This year cultivation area is likely to limit only 10,00,000 hectare just 1/5 of last year cultivation when market rate of guar was 5000/100 Kg and other crops rates were lower than Guar. This year Guar is trading on 3100-3200 comparatively other commodities are being sold at higher prices. This year Guar doesn't seem to give good return to farmers in comparison to other crops and farmers are not taking interest in guar cultivation as their primary crop. Some farmer use it as crop rotation, green manure, farm development they can work go for Guar cultivation which will come under 10,00,000 hactare area. Demand of Guar seed from cattle feed will increase. At low price guar is used to produce to Guar korma which is supporting guar prices at lower level. Consumption of guar korma is increasing worldwide. Generally there is 56-58% protein in Guar Korma while there is only 41% protein in Soya protein. soya protein is costlier than Guar Korma. Guar Korma is being exported at Rs 38/Kg and Soya protein is being exported at Rs 49/Kg. Guar is having 15 % more protein and Rs 10 cheaper than Soya protein. Quality of production ( Guar seed ) will be poor. As per prediction this year there will be more rainfall and high humidity. In high humidity condition guar started to degrade and it turn brown or black. Even some time the Gum started to decompose. Standing crop also affect drastically. Infection of disease like bacterial blight and root rote increases in high humidity condition. Some time crop doesn't mature on time if there is more humidity in soil. Even seed doesn't dry after sowing, which are not suitable for filling in bags. Crude prices is the major factor which will lead guar rates to upper level. In normal condition guar can go up to 5000/100 kg if crude will support then it may reach up to 6000-7000/100 Kg. right now crude is at its lowest level and it is improving slowly and slowly. In long term crude will up to 40-50% at from this level or it will reach up to 60-70 USD/ barrel. Any positive sign from crude oil industry will make a positive impact on Guar seed prices. This year there will be gap between demand and supply. In the case of price rise this Gap will be more wide. farmers and traders will hold the commodity. Already situation looks more tight and it will make it more severe. Speculators and stockist will become active and prices will move very fast. Up to settlement of July contract there will be some pressure of supply . For long term position this level is good for making position in market. Guar will give good return in 12 months. Will guar seed drop down lower than INR 2982 or move higher than INR 4200 ? After the strong forward position in Future market Guar prices hit high and crossed 3300/100Kg. Guar seed is regularly under pressure after the harvesting of fresh crop. At the starting of harvesting guar seed prices were trading at 4200/100 Kg on 12th October 2015, after that guar seed started to fall regularly due to excess production and low consumption. Falling crude prices hit if double strike. Within two months on 14/12/2015 guar reached down to 3100/100 Kg. from that level it started to gain and on 04/01/2016 guar reached INR 3425/100 Kg. From that level it again started to go down and on 02/03/2016 it reached to lowest level of last four year at INR 2982/100 Kg. It recovered form that level and it reached to INR 3557/100Kg on 25th April 2016 and it again started to fell down and dropped to INR 3100/100Kg on 21/06/2016. Guar seed is moving between INR 2982/100Kg to INR 4200/100Kg. Now Guar seed has two directions lower than 2982 and upper than 4200. There are three major factors which will decide the rate of Guar those are Production of Guar , Holding of Guar and Consumption of Guar. Guar is major Kharif crop in Guar growing belt, which is grown in long geographical area from Haryana to Gujarat in a single belt. This year production area is expected to drop down to 10, 00,000 hectare, which was 55, 81,216 Hectare in Year 2015-2016. 47, 86,781 Hectare area was in Rajasthan and rest of around 8, 00,000 hectare area was from other states like Punjab, Haryana and Gujarat. This year other states Guar cultivation area will be below 1,00,000 Hectare and from Rajasthan it will be around 9,00,000 Hectare. Total Guar cultivation area will remain around 10,00,000 Hectare, which is 20 % of last year production. Around 80% sowing has done in this pattern. In any situation guar production will not cross 15,00,000 Hectare. As per above figure total Guar seed production will be 5, 00,000 MT (50 Lac Bags). Last year guar seed production was 27,51,423 MT (2.75 Crore Bags), as per traders it was only 2 Crore Bags. Around 3,60,000 MT Guar gum has been exported last year, means around 10,80,000 MT Guar seed has been processed only for export purpose. IF we add 30% for domestic purpose then total 15,00,000 MT Guar seed has been processed or 1.5Crore Bags has been processed. 16,000 MT guar seed has been used for sowing. Generally there is 18 %-20% moisture at the time of harvesting it reached up to 10-12% in one year. 6% average moisture loss of total weight that will be around 1,65,085 MT moisture loss. There is another 5 % loss of sand, plant parts, low quality and domestic use by farmer, that is 1,37,571 MT guar seed. total carry forward for this production year it is 12,32,768 MT or 1.23 Crore Bags It is in very loose condition as per Govt data of production. If there is 2 Crore bags guar seed production instead of 2.75 Crore then carry forward will be only 50 Lac Bags. As per market men/ traders this figure is not more than 7,50,000 MT guar seed in market including last carry forward. At maximum side only 7,50,000 MT (75 Lac bags) of Guar seed is lying with farmers/ traders/ stockist/ factories. Total Availability of Guar seed for this financial year and up to next production arrival ( Total one year and Six month up October 2018) will be 1,73,27,670 Bags or 17,32,676 MT ( 1,23,27,670 Bags: current Carry forward 50,00,00 Bags : Current year expected production). 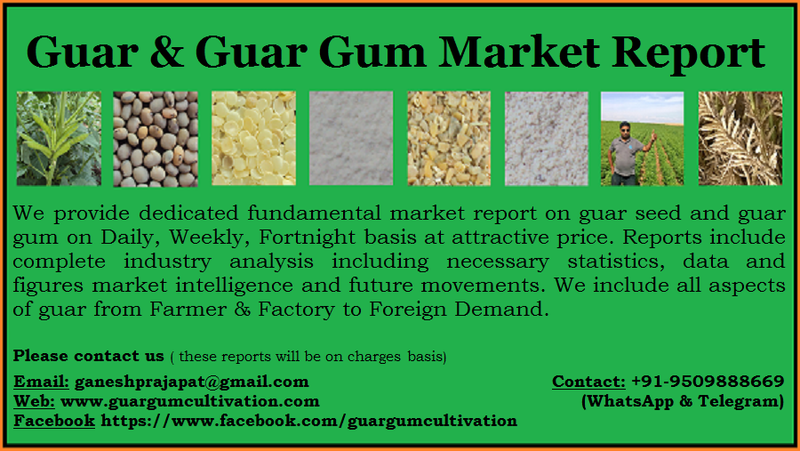 Above calculations are as per current demand of Guar gum and Current crude rates. If demand increases and rates goes up then holding of commodity will increase in market. In normal supply condition there is scarcity of 10,00,000 Bags If rates goes up then holding will increase and There will be scarcity of 1,00,00,000 Bags for Guar gum processingindustry. Due to high prices of pulses and extra monitoring by govt and expectation of good return in Guar market will hold more Guar than this year. Especially in western part of Rajasthan Guar is a cash crop and farmers keep it hold for their financial needs. In the news of low production traders and stockist and speculator will also hold a good quantity of commodity from market. For next financial year there will holding of same amount of commodity as this year. With increasing prices situation of supply can be tighter and farmers will hold more commodity. There will holding of Guar seed from 50, 00,000 to 1, 00,000 MT. For next year at current demand and crude price there will be no carry forward for next to next year- 2017-18. In 2016-17 all the seeds will be used and scarcity of 5,35,871 MT of Guar seeds. If we assume that market will hold 10,00,000 MT seeds then there is scarcity or short supply of 1.5 Crore bags for Guar gum processing industries for this financial year and up to next production in October -2017 . In normal condition consumption can be assumed as current year guar gum seed production 15,00,000 MT April -2016 to March 2017 and 7,50,000 Mt up to next guar production up to October 2017. Total guar seed consumption will be around 21,50,000 MT up to next production. If demand from Churi Korma industry remain same then it may reach up to 25,00,000 MT and If demand from oil and Natural Gas industry also increases then there will consumption of 30,00,000 MT for 18 Months. Crude will not remain below 50 USD/ barrel for next 15 months. Guar Churi & Guar Korma industry will also give good boost for the consumption of Guar seed . Production, Demand and Consumption are at lower side in current situation. Production can’t be increase up to Next 15 Months till October 2017. Meanwhile demand and consumption will increase then Guar will again reach in Year 2012 movement and rates of guar will sky rock. Guar seed will reach up to 5000/100Kg in current sluggish condition and it may cross 10,000 in good condition. Side by side speculators, stockist and future contract will also affect Guar prices. Processing capacity of guar gum processing industry will also increase. Some closed plant will also start to work. Positions can be made for next 12- 15 Months Guar will give good return it can be somewhere 100 to 200 %. From 20th July 2016 onward Guar will never move toward INR 2982/100 Kg even in worst conditions. This year Guar cultivation area is shrinking drastically. Farmers are avoiding Guar crop after two year long downfall in guar seed. Farmers are more focused on other kharif crops than guar crop. In rain fed area of Rajasthan farmers are preferring Moong and Moth. In irrigated area of Gnaganagar and Hanumangarh there is no irrigation and no primary rainfall. Farmer may consider Guar as prospective crop but it will be under rain fed conditions. In Haryana Farmers are replacing guar gum crop with lentil, Maize and Bajara crop. Guar gum seed cultivation area will go down in rain fed area. In some rain fed area there was pre monsoon rainfall and farmers have sown Moong Moth and Bajara crop. In one 50 km long patch from Rajgarh to Jhunjhanun there is more than 80 % sowing under Moong crop. In some patches there is Bajra crop cultivation. There was hardly any farm which is under guar crop cultivation. While discussing with a small trader located at Haryana Rajasthan border. He said that farmers are not touching guar crop just because of low rate of guar. Mostly farmers are putting Moong seeds Few farmers are going for Bajara Crop and hardly there is any farmer who is going to Guar crop cultivation. Local market may face a lot of scarcity of guar seed. Though major cultivation of Guar crop start in July as it is sown as late crop. But if major cultivation area will filled by other crop then Guar will not find space for cultivation. Remaining farmer will also make mood same as other neighboring farmers. Arrival of Guar will dropped up to 80% in Rainfed area. As per current area Guar will share more than 10% of total cultivation area in Rainfed area. Share of Rajasthan in Guar production will increase up to 90% but total production from Rajasthan will drop down. In Haryana Guar cultivation area us replaced by Bajara, Maize and Lentil. Farmers in Haryana are not preferring Guar crop they are replacing Guar cultivation area with Bajara, Maiz and Lentil. Water was available in farms timely and most of cultivation is coming under these crop in Guar cultivation area. Now there is minimum chances of changes in trends. Share of Haryana in guar cultivation area will drop up to 2-3 %. Generally Harayana is considered as supplier of best quality guar gum splits. 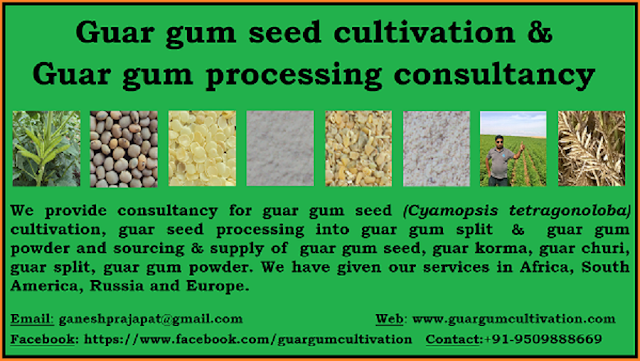 Guar gum split and guar gum powder Industries located in Haryana will be depend on Rajasthan guar production. It can be also increase in raw material cost of industries located in Haryana. Guar gum split and Guar gum powder industries located in Siwani will not affected but industries located in Bhiwani, Hisar and Adampur will face some supply problem. 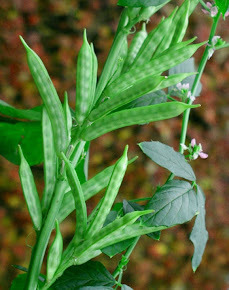 In recent year Guar was cultivated in Punjab. But farmers are saying good bye to Guar. Most of guar gum seed cultivation area is replaced by the Rice / paddy crop some area has gone under Lentil and Maize. Share of Punjab in Guar cultivation area will drop down to 1-2%. In Gujarat farmer will also replace guar crop with other Kahrif crop like Cotton, Bajara and Groundnut. Share of Gujarat in Guar cultivation area will drop up to 7-8%. Farmers have totally demoralized with Guar seed rate in local market. 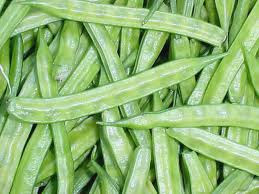 Industries are purchasing Guar seed regularly. Most of Guar split mills which are more than 4-5 years old are running in full capacity. Farmers are regularly carrying guar to mills. Industries are processing it and selling Guar Churi, Guar Korma at higher rate. Some new industries like Guar Korma roasting, grading, cleaning and shorting has come in existence and they are using latest technology for shorting and roasting. There is full fledged export demand of guar korma and Guar churi. Guar korm is exported regularly with good demand. 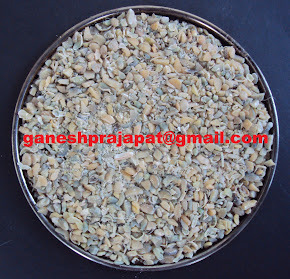 There is regular demand of Guar seed in market at current rate. These industries don't want that Guar seed rate should go up. At current situation there is low demand of Guar gum. If the rate of guar seed goes up then it will hard for them to get margin. There is also some market news that local companies have purchased the Guar Gum from market. In last week there have been buying 3000 MT guar gum split in local market. This is a export oriented buying. Crude oil is fluctuating and it is not maintaining the level above 50 USD. 50 USD/ barrel is psychological level for Guar seed rate growth. Crude oil will come out from the fluctuation and it wil give support to Guar gum and guar seed prices. Future movement of Guar seed and Guar Gum. Guar seed prices will remain under pressure in next month. Once the sowing will complete then Guar seed prices will take upward movement. Crude oil prices will be major factor which will impact Guar seed prices. Prices of other cattle feed production Khali, Maize, Bajara, Chapad will also give a boost of guar prices. Major factor will be prices of Soya protein. Guar korma is used as replacement of Soya protein. Fundamentally guar is very strong production side there will be unexpected down fall in quantity and quality both. If the quality is not good then more guar seed will require to produce the same quality of Guar gum split. Long term positions can be made at list for three - four months. Next year in January and February the picture will be very different. If people go for one year positions then there is certainly multi fold returns whether in this year or in next year. Up to 15th July or July contract there will be some sluggish movement but after it Guar investor will be at safe position.